Midland Metro’s Wednesbury depot underwent a major expansion to cater for a fleet of CAF Urbos 3 trams, introduced on the Birmingham to Wolverhampton line in the West Midlands.To accommodate these longer vehicles, the size and capacity of the facility was increased and a new sand filling system added, to replace existing equipment installed in 1999. By working with our partners at Klein, we were able to recommend a mobile package that offered more flexibility than the specified fixed installation and would save the client money. Consequently, two Sandfloh filling vehicles were commissioned, along with a garage and silo capable of storing ten cubic metres of sand. The powered carts differed in specification and comprised a type 202E that carries approximately 200 litres of sand and a 102 “off road” model, which has a smaller capacity, but can operate on any terrain. Both work independently of external air and power supplies and are easy to use, incorporating Klein’s ergonomic filling nozzle. Because the equipment was purchased as one order, the total installation took just three weeks. It was overseen by our onsite team with assistance from a Klein supervisor. The first CAF tram entered service in September 2014, following rigorous testing at Wednesbury where the fleet will be maintained. 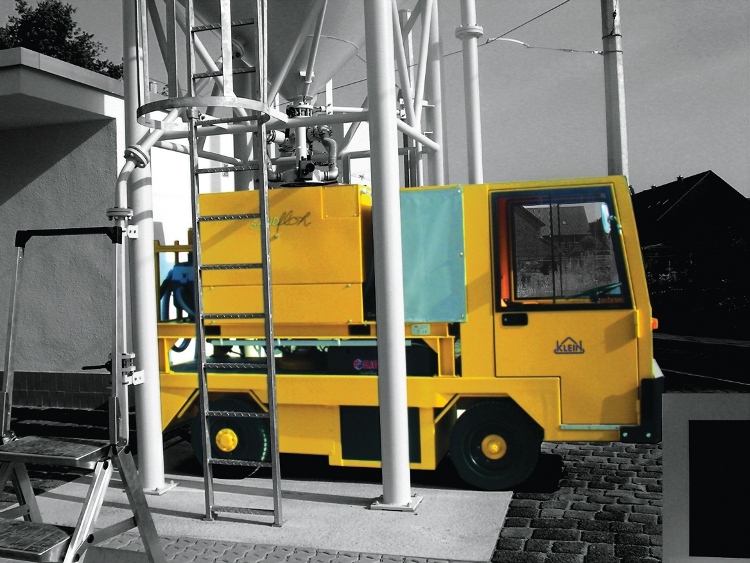 The Klein equipment fits seamlessly into this process, providing a quick and reliable way to replenish sand stocks.